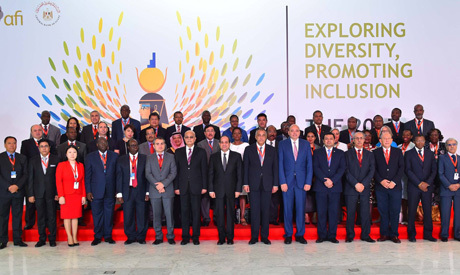 The world's "most important" forum on financial inclusion kicked off in Egypt’s Sharm El-Sheikh on Thursday, with a keynote address by President Abdel-Fattah El-Sisi. The two-day 9th Global Policy Forum, organised by the International Alliance for Financial Inclusion (AFI), brings together some 95 states and 119 international financial institutions. During his address, President El-Sisi stressed on the importance of financial inclusion as one of Egypt’s main targets that will help include all citizens, especially women and youth. It should ensure their access to financial services and help in merging the informal economy into the formal one, Sisi added. This should boost economic growth and improve the living standards of citizens. El-Sisi noted that Egypt’s budget deficit stood at 9.5 percent during the fourth quarter of the 2016-2017 fiscal year, which ended in June, down from 11.5 percent during the same quarter last year. During the conference, Egyptian representatives will discuss the country’s experience with financial inclusion, especially with regard to micro, small and medium-sized enterprises, state news agency MENA said. AFI has said the forum is the "largest and most comprehensive event" it has ever held. The gathering will introduce "unique financial inclusion initiatives undertaken by members in the Arab region," AFI said on its website. Under the auspices of the Council of Arab Central Banks and Monetary Agencies’ Governors, and in the presence of President El-Sisi, the Arab Monetary Fund (AMF), the Deutsche Gesellschaft für Internationale Zusammenarbeit (GIZ) GmbH, and the AFI launched the Financial Inclusion for the Arab Region Initiative (FIARI) on 14 September 2017 during the 2017 AFI Global Policy Forum held in Sharm El Sheikh, Egypt. FIARI aims to help accelerate policies and actions conducive to enhancing Arab societies’ access to financial services through an effective coordination mechanism by supporting the implementation of national financial inclusion policies. The regional initiative uses financial inclusion as a driving force for sustainable economic and social development in alignment with the United Nations Sustainable Development Goals (UN SDGs). During his speech in front of the summit, chairman of the board of the Arab Monetary Fund (AMF) Abdel-Rahman Al-Hamidy highlighted the importance of the programmes aimed at enhancing financial inclusion in the Arab world. He also highlighted how momentum towards financial inclusion in the Arab region was reinforced by the regional Financial Inclusion Task Force (FITF) in 2012 and organising an Arab Financial Inclusion Day to be held annually on April 27. The official forum was preceded by three days of AFI meetings in Sharm El-Sheikh, including AFI policy working group meetings and the annual AFI general meeting. The official forum was preceded by three days of AFI meetings in Sharm El-Sheikh, including AFI policy working group meetings and the AFI annual general meeting. The AFI general meeting endorsed the Sharm El-Sheikh Climate Change Accord, which mandates the AFI network to pursue peer learning on practical policy solutions to the intersecting challenges of financial inclusion, climate change and green finance. Last year's forum was held in Nadi, Fiji.